More and more small offices in Ireland are using OKI printers finding that they give fast print outs and good results. 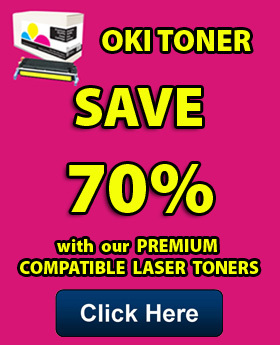 While the printers are efficient and reliable, the OKI toner ink can be expensive for a buy office. Most OKI printers will produce colour printing but a busy office will find itself using more black ink and toner than colour. What steps are offices and busy home users taking to reduce the cost of their ink and toner? A local supplier will not be able to give you the deals for your ink and toner that you will receive on-line. A good on-line supplier will offer you a twin pack of OKI black toner ink for 50% less than you would pay for buying two single toner inks. This deal wouldn’t be offered to you locally as the small stationery shop just doesn’t have the buying power to match the large on-line supplier of ink and toner. Search on-line for the multipack deals on OKI toner ink, you can buy 4 OKI colours and get a free black toner ink cartridges with some suppliers. The on-line suppliers of ink and toner are after your repeat business and crave your custom, you can contact them and ask them about customer support. If there are any issues can you contact them to discuss them? Is there a money back guarantee on the ink and toner if you are not happy? If you get yes to these questions then you have found yourself a supplier that can at last save you money on your OKI ink and toner. The volume levels of compatible OKI toner ink cartridge are generally greater than those of an original toner cartridge. Always check the approximate page volumes of the ink and toner cartridges before you buy but as a rule of thumb, there is usually more ink and toner in a compatible than an original cartridge. This is not because the toner cartridge is bigger (it must be the same size to fit in your printer), it’s just that the original manufacturers of the toner ink do not fill the toner cartridges all the way to the top. You may find that you will get up to 10% more toner ink on average using a compatible toner ink than an original. What is the most important factor in business today? Saving on running costs and one way to do that is to get clever and start using compatible OKI toner ink. Getting more pages per toner cartridge, free black toner ink if you buy a full set of four toner inks, discounted twin packs of black OKI toner ink – all these factors will add up to great savings on your OKI ink and toner over 12 months. Get on-line today and start searching Google for compatible OKI ink and toner, spend a little time researching the best on-line suppliers out there, when they meet all your desired criteria place your order and don’t go back to paying over the odds for your OKI ink and toner.